Father Nick Adam moved to Mississippi in 2008 to embark on a career in sports broadcasting. 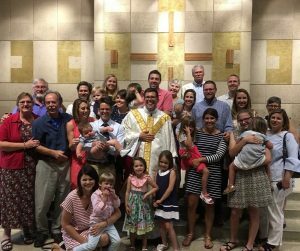 After more than four years working at WTOK-TV in Meridian as a sports and news anchor, he decided to follow a call to the priesthood and study for the Diocese of Jackson. The youngest of eight children, Fr. Nick grew up on the Alabama Gulf Coast and attended the University of Alabama. He is a huge sports fan, and enjoys playing basketball and watching SEC football (especially his beloved Crimson Tide☹) He also tries to enjoy playing golf. Father Nick’s mother, Claudia, was the principal of a Catholic grade school, and he is so excited to be assigned to St. Richard. He was ordained a priest on May 31, 2018 at the Cathedral of St. Peter the Apostle in Jackson. He decided to study for this diocese because of the relationships he developed with the priests and the people of Jackson throughout his time working and in the seminary. He has a bachelor’s degree in Communication from the University of Alabama and a Master of Arts in Theological Studies from Notre Dame Seminary in New Orleans. He has a special interest in educating lay Catholics about living out their call to holiness and focusing on building virtue in a world that desperately needs it.